There are hundreds of photo-worthy spots along the coast and there’s no doubt that you’ll fall in love with the area if you visit. 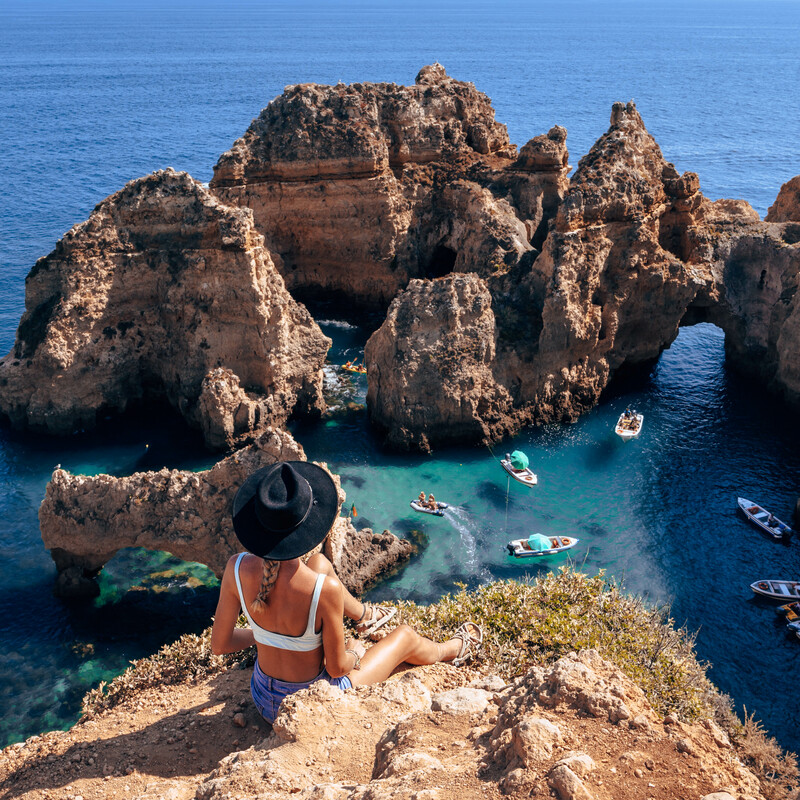 Here is a list of my favourite spots that you should check out if you do take a trip to the Algarve area. Let’s start with my favourite place in the Algarve, and also the most difficult place to access. Praia de Benagil is a small beach in the tiny town of Benagil. This beach is nothing out of the ordinary however around 200 metres to the east of the beach the sea has carved a cave into the rock which has it’s own beach inside. The cave has two entrances and also a hole in the roof which can be accessed on foot from a car park on the cliff above. The best way to reach the beach is to rent a kayak or stand-up paddle board from Benagil Beach as this allows you to paddle into the cave and stand on the beach inside. You can also take a boat trip but you won’t be allowed to get out of the boat or access the beach but you do get to go inside the cave in the boat to take photos. It’s also possible to swim round to the beach and back, however the sea here can be quite rough with strong currents so I would not recommend this option unless you are a very competent and confident swimmer. Most of the photos you see advertising the Algarve are from this area. The rock formations here are stunning and the beach is quite large compared to other beaches along the Algarve. The beach is accessed by climbing down some steps and there’s a beach bar at the bottom if you need refreshments while you’re there. At the top of the steps is a car park and various stands selling ice creams, bags, souvenirs, hot food etc. The cliff paths here are particularly stunning to explore, especially at the golden hour before the sun sets. If you do visit Praia da Marinha you should definitely plan some time to take a walk and explore the cliff paths in the area. This beach is actually a series of beaches reached by scrambling over rocks and through caves and tunnels. Access to the beaches is relatively easy and should be possible for most people. If climbing through rocks isn’t your thing, the first beach is huge and there are facilities to rent sun beds with umbrellas for a small fee. There are a series of beach bars along the different beaches too so you can grab food and drinks if you haven’t brought any with you. This beach is ideal for photographers due to all of the caves and tunnels which perfectly frame the gorgeous rock formations that are scattered along the Algarve coastline. This beach is next to Benagil Beach (to the west) and is perfect for all you adrenaline junkies out there as it has a place to jump from the cliff into the sea. The beach, like most on the Algarve, is small and is reached by climbing down some steps. There is plenty of parking near the beach and the cliff paths in the area are a stunning place to explore if you don’t fancy spending the whole day lounging on the sand. More specifically, the area around Ponta da Piedade (a lighthouse surrounded by beautiful cliff paths and rock formations) is truly stunning. The sapphire blue water is crystal clear and the views are breathtaking. You can take a water taxi or boat trip to explore the numerous caves and tunnels carved into the cliffs in the area, or you can take a kayak tour if you’re feeling more active. If you fancy relaxing on the beach after exploring the area there are plenty of spots within walking distance from the car park at the lighthouse. Praia do Camilo, my favourite beach in the area, is a 10 minute walk away and is accessed by a long wooden staircase. There’s even a tunnel carved into the rock which leads to another beach! Like most beaches on the Algarve, Camilo Beach can get quite busy so it’s best to get there early in the morning or late in the afternoon to make sure you can get a good spot without feeling like you’re sitting on top of someone else!